Best WordPress Social Media Plugin: Longing for Likes and Shares? Social media is not only useful to increase your brand’s exposure, it’s also an important ranking factor in Google’s search algorithm. 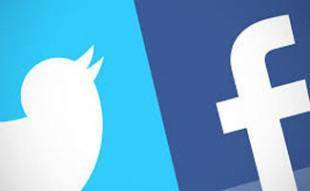 Top ranking sites typically have a high number likes, shares, +1’s, tweets, and so on. If you’re on WordPress, having a social media plugin installed that connects you and your readers to your various social networks is a must. Want A Variety Of Social Media Plugin Options? You’ve come to the right place. When it comes to WordPress social share plugins, one size does not fit all. Our top ranking plugins all give you access to customizable social media share buttons and a host of other features. In addition to these types of WordPress social media plugins, there are many specialized social media plugins that perform a wide variety of functions to assist you with your social media management, performance and presence, so be sure to read through all of our reviews (not just our top winners). You may find exactly what you’re looking for in a more specialized plugin. There are a ton of social media plugins for WordPress available. How did we narrow down our recommendations? We’ve chosen our winners based on several factors, including design quality, speed, features, customization capabilities, analytics tools and more. The Easy Social Share Buttons (ESSB) plugin by appscreo wins our top spot for the best WordPress share button. It is the plugin we use on our sites (after testing a multitude of other options). ESSB is packed with features and integrations that support 45 of the major social networks, including many optimized mobile messengers. ESSB also offers 52 templates, 27+ design positions, 30+ animations and customizations, a wide range of social media widgets and a shortcode generator. It is kept up to date, with new features added regularly. You have the ability to display your social share icons in just about any location you want. Sound too complicated? This plugin also has you covered with an intuitive customization wizard to help you set everything up within minutes. A regular license includes all this for only $19. An Easy Social Share Buttons license comes with 6 months of support and future updates. You can extend support to 12 months for an additional $5.63. Social Warfare wins our number two spot as the best WordPress social media plugin. Social warfare provides some highly polished share and counter buttons, with nearly endless customization options available. 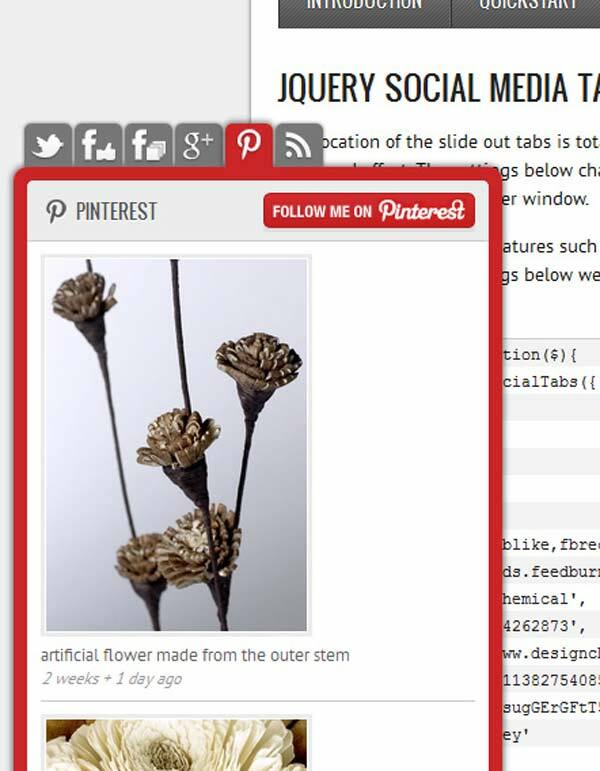 This plugin also offers some rare features — you can add Pinterest images that load quickly, tweetable quote boxes in different designs within your content box, and custom tweet quotes to individual posts. Social Warfare also includes the Frame Buster plugin that prevents people from adding content over yours. Although it lacks existing integrations with third-party extensions, Social Warfare is developer-friendly, so you can extend its functionality with add-ons. Social Warfare offers a 45-day money back guarantee. You must renew the license annually to access updates and priority support. Our third-place winner, Ultimate Social Deux’s biggest selling points are its speed and low price. 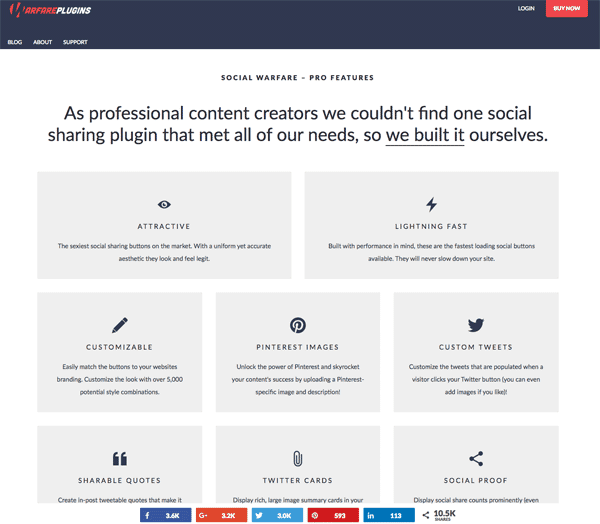 This WordPress social plugin by WPSmarter doesn’t have a ton of features, but it’s simple enough for anyone to use. And it has the basics — social buttons, counters, 20+ display locations, eight skins and shortcodes. Their integrations with Google Analytics, WooCommerce and Visual Composer are big pluses. Ultimate Social, however, only supports ten social networks (no Instagram), and lacks many customization features you’ll find with major players. And if you need tech support, reports suggest it’s slow going. 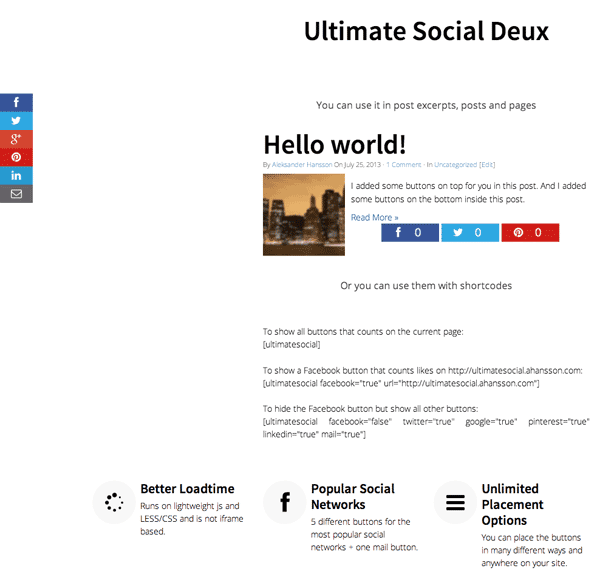 An Ultimate Social Deux license comes with six months of support and future updates. You can extend support to twelve months for an additional $4.13. As we discussed above, social media plugins come in all sizes and specialties. 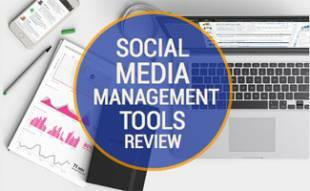 Some focus only on WordPress social media buttons, while our top picks above include all-encompassing social features and analytics. If you need even more, or have a specific need that wasn’t met by one of the offerings already covered, be sure to read the following reviews that include support for display feeders, simple sliders and more. Looking for a lightweight social media slider plugin that’s easy to install and setup? The Facebook Likebox Slider plugin by ARScode is among the best on the market for the WordPress platform. This WordPress social network plugin doesn’t give you a ton of features, but that’s not what it’s designed for. Facebook Likebox Slider offers support for Facebook, Twitter, Linkedin, Pinterest, Google+, YouTube and Vimeo — not as many social networks as other plugins, but they cover the major ones. They also have an easy three-click configuration, which makes setup a breeze. And you get some decent customization on where and how your slider displays. A Facebook Likebox Slider license comes with six months of support and future updates. You can extend support to twelve months for an additional $5.25. 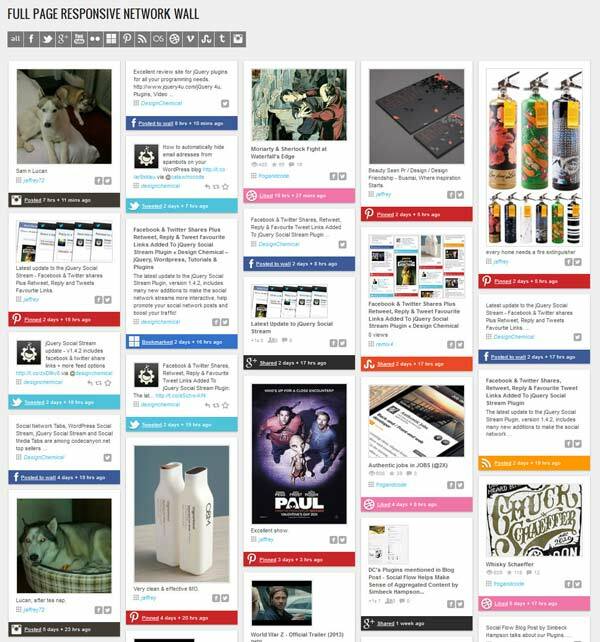 The Flow-Flow WordPress Social Stream Plugin by Looks Awesome gives you some great tools to display social media posts from multiple sources on any page of your WordPress website. You can customize any combination of feeds from Facebook, Twitter, Instagram, WP posts, RSS and more, and they’re all connected within the same single stream. Flow-Flow also gives you a lot of customization capability with layouts, color schemes, animations, hover effects, lightboxes and more. And you can live preview your display before launching. A Flow-Flow license comes with 6 months of support and future updates. You can extend support to 12 months for an additional $9.38. 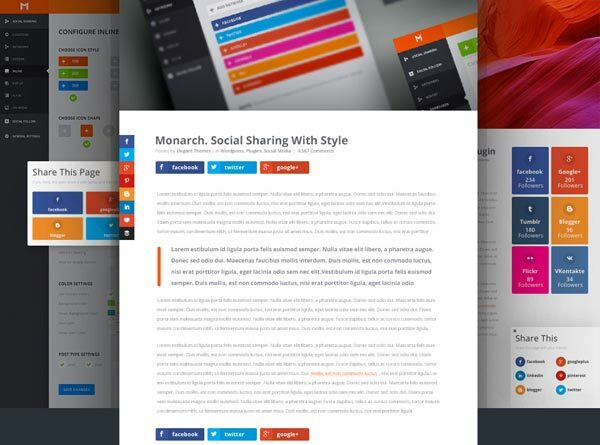 Monarch is one of the most popular social sharing plugins these days. This fast plugin gives you support for 35+ social networks, as well as customizable buttons, counters and page location display options, including automatic pop-up, auto fly-in, on videos and images, and more. You can manage all your settings and view statistics through the custom panel in the WP dashboard, and you can import/export settings from one WP site to another. 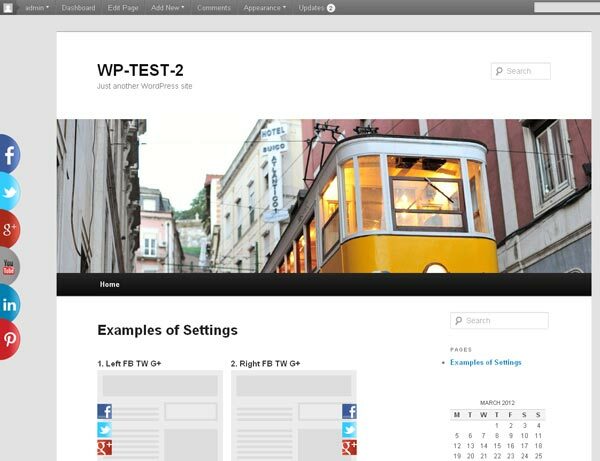 If you already own a developer license for Elegant Themes (a top provider of WP themes), you have access to this plugin for free. Otherwise, the cost is $89 per year, which gives you access to all 87 of the service’s WP themes and five plugins. If you’re managing multiple websites, the price is hard to beat. Monarch by Elegant Themes offers a 30-day money back guarantee. You must renew the license annually to continue receiving updates and tech support. 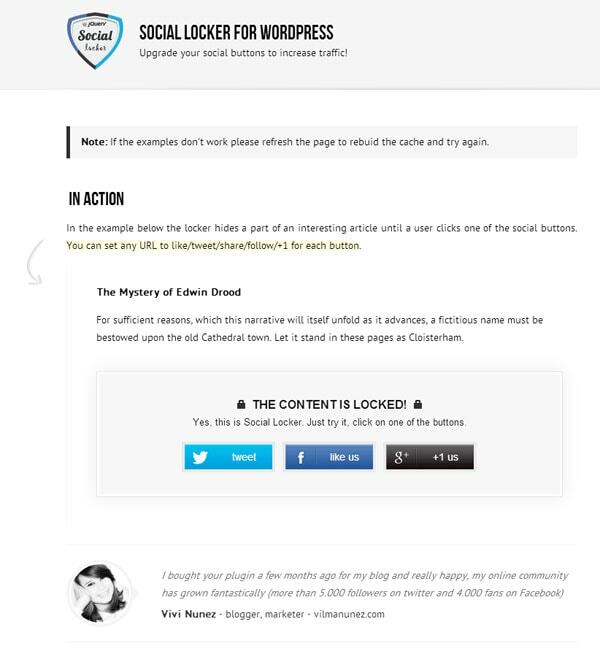 Social Locker by OnePress is a unique WordPress social media share plugin that allows you to maximize your site’s social media performance by locking your selected site content until your visitor likes, shares, +1s or tweets your page. And the locked content is SEO friendly, meaning it’s still visible by search bots. This plugin provides social buttons for major social networks in the same interface: Facebook, Twitter, Google, LinkedIn, Youtube (Pinterest and Instagram are coming soon). They also provide sign-in buttons to register users on your website to increase your conversions. A Social Locker license comes with 6 months of support and future updates. You can extend support to twelve months for an additional $7.88. Social Network Tabs by designchemical (the developer of WordPress Social Stream, whose review you’ll see below) is similar to the Facebook Likebox Slider plugin in that you can create a simple slider menu. But with Social Network Tabs you can also create static tabs. Unlike Facebook Likebox Slider, Social Network Tabs supports 15 social networks (compared to their 7 offered), and based on our user reviews; Social Network Tabs tend to be buggy without a ton of tech support to help you through the kinks. A Social Network Tabs license comes with 6 months of support and future updates. You can extend support to 12 months for an additional $4.13. WordPress Social Stream by designchemical (the developer of Social Network Tabs) is a must-have WordPress social plugin if you want to combine an unlimited number of social network feeds under one domain name or create a single feed for multiple social network profiles. 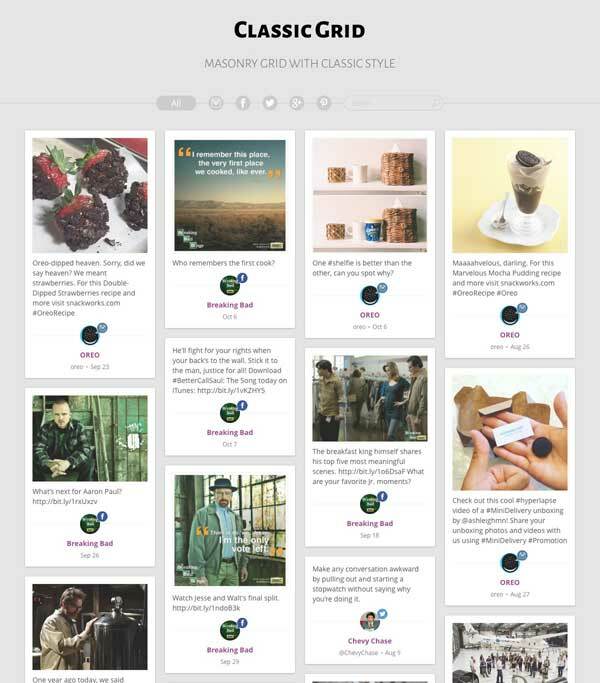 You can customize how these feeds appear on your site by rotation or a social stream wall. This plugin includes 15 social networks (all the biggies) and sixty feed options and provides you feed shortcode and wall shortcode, as well as custom CSS capability. A WordPress Social Stream license comes with six months of support and future updates. You can extend support to twelve months for an additional $6.38. What About Free Social Media Plugins For WordPress? AddToAny is a solid free option for free social sharing buttons. While AddToAny doesn’t offer advanced features, you do get social media buttons for Facebook, Twitter, Pinterest, Google, WhatsApp, LinkedIn, Tumblr, Reddit, and over 100 more sharing and social media sites and apps. They also provide counter buttons, floater, vector and universal buttons, and a few custom positions. What don’t you get? Analytics, integrations, and dependable tech support. Jetpack is a large, multi-purpose WP add-on that includes a popular free social media extension, but there’s a certain price to pay. To get their free social buttons, you must install the entire Jetpack plugin, which can be an enormous strain on your site’s resources and loading time. ShareThis offers easy, attractive and free social sharing buttons for your site, but that’s all you get. There are no button counters, analytics, or any other functions you can perform other than getting free buttons. Social media can be particularly indispensable for small businesses that don’t have much in their marketing or advertising budgets. If you need to launch or boost your company’s social media strategy, be sure to read our tips on how to build your business using social media. And check out the video below by The Wall Street Journal that has some insightful advice on how small businesses can get ahead through social media. Keep Your Visitors Coming Back! As we explained earlier, your site’s search rankings, visitor conversion and overall appearance depend heavily on your social media performance. Another must-have for visitor conversion is to use subscribe forms on your site. 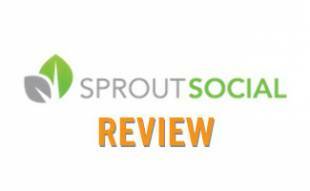 Easy Social Share Buttons, our number one pick, is the only social media plugin in our reviews that includes a subscribe form module. There are several excellent WordPress form plugins that allow you to create subscribe and many other types of forms. Read our best WordPress form plugin reviews to learn more, or check out all of our WordPress Plugin suggestions. What are you trying to get out of a WordPress social media plugin? Thank you very much for this great list and sharing all this information about the different tools. Another important aspect in my eyes is, not only to wait for your users to share your posts, but do actively cross-promote your posts across multiple networks and sites. Do you plan to update the list sometime? If so, I would like to introduce another interesting tool to you. For automatically cross-posting your blog posts on social media take a look at the Blog2Social plugin. It has powerful options for easily sharing your posts across all popular social media networks in one easy step. You can optionally customize your posts for each network and automatically schedule your posts for the best times to share. The plugin is a big time saver for cross-promoting your posts. We conduct regular audits. I’ll be sure to add Blog2Social to our list of potential additions. Thanks! Advance Select And Share PRO – WordPress Plugin is also one of the lesser known social share plugin that you can use to share texts from the post in different social networks like Facebook, Twitter, LinkedIn and many more. This plugin comes with 8 most popular social media sites support and 20+ preset layouts. You can create any design which looks great with your site design within one click. Great list, wondering if anyone out there has had any first-hand experience with any of these?